Azuma Patisserie is a popular Japanese cafe that was originally inside the Regent Place building before moving across the road next to the HSBC food court. The cafe serves Japanese inspired desserts and drinks which include Green Matcha cakes and standard cakes found at most other cafes, I’d always been meaning to visit but never got the chance and thought it had closed down before it reopened across the road. The interior is nothing special, in fact I think it’s kind of run down because I remember the original store in Regent place being quite polished and having nicer interiors. Miss K and I decided to grab a few desserts/drinks after dinner and the first to arrive was the Green Tea Matcha Latte (above) which came as part of a set including a cake. 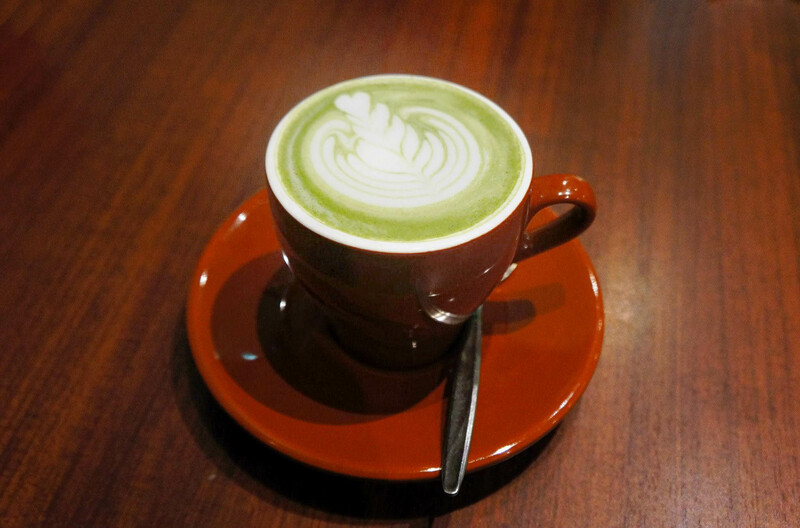 The drink is quite simple actually, it’s basically a hot sweet and creamy matcha powder mix with frothy milk that’s pretty hard to get wrong. 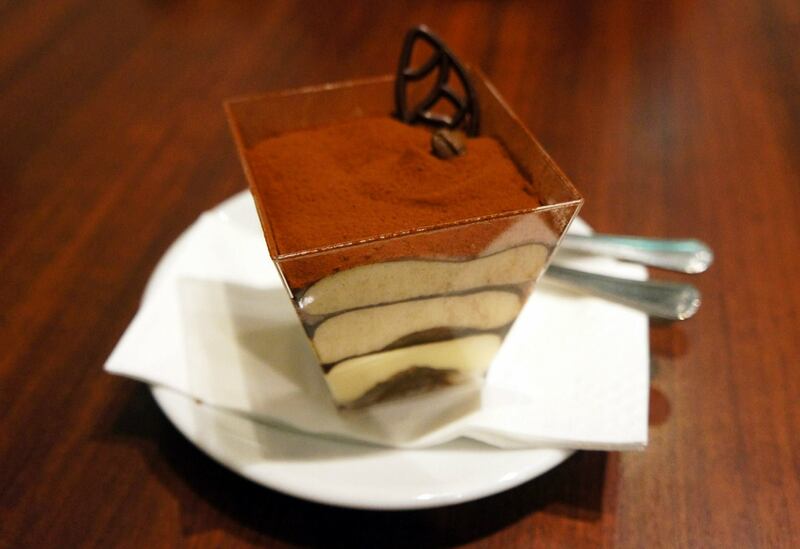 The cake that came with the set was a plain Tiramisu, nothing special at all as I chose this one over the Green Tea Tiramisu that also looked kind of interesting. This cake reminded me a little of the Hello Happy Korean cafes in Strathfield that also have a similar cake and drink choice. I enjoyed the taste and especially liked that the cake was served cold rather than at a room temperature. 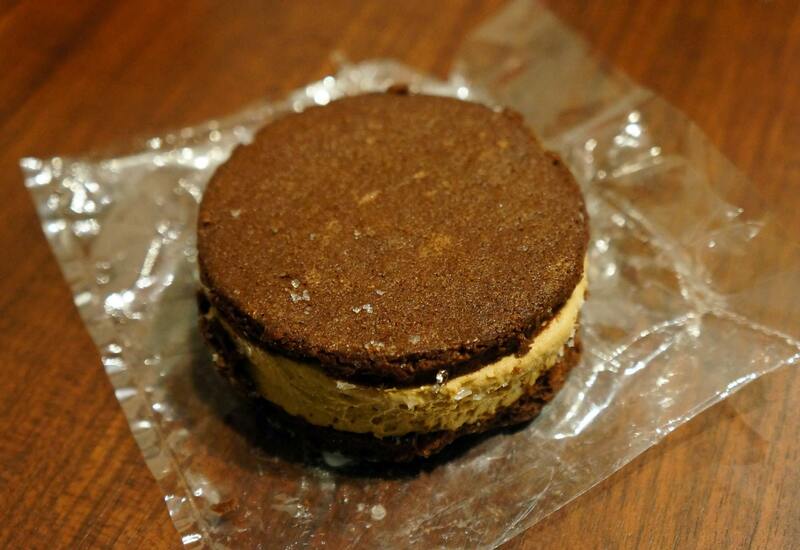 To wrap up the dessert, Miss K decided to grab an ice cream sandwich because they looked quite interesting. The one we picked was a hazelnut flavour and it turned out be quite nice although nothing special in particular as it’s basically two cookies with hazelnut ice cream in between. Overall if you’re out and about later at night on George Street this isn’t a bad choice for dessert since they have some nice cakes. I wish they’d put some more effort into the interior and perhaps on some sound proofing as well because the traffic right outside is quite noisy but otherwise the stuff they serve is enjoyable and the prices are decent which is a nice plus! WOW! I must try this dessert place out! Really want that ice cream sandwich! sad to say this location will close its doors soon too!